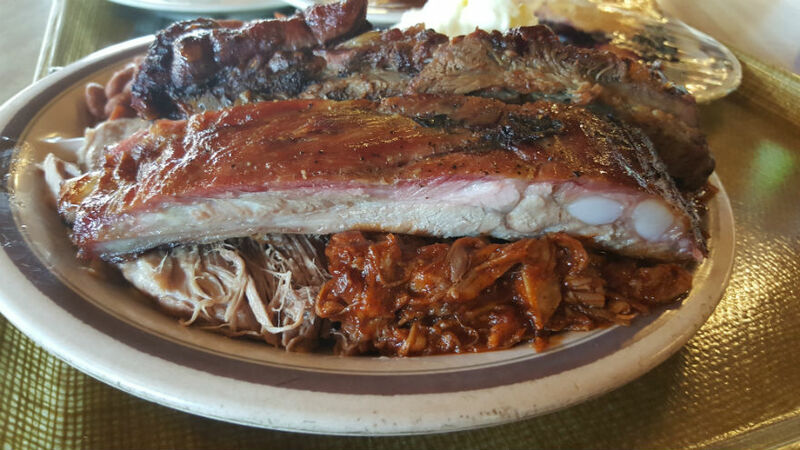 I wrote a review of the Pit way back in 2008, before I became a Kansas City Certified BBQ Judge. I thought I must go again and see if my palate had changed at all. I guess not too much. I wasn’t knocked out by it back then, and today was possibly a little worse. While this place is a local favorite since 1947 (Yikes! ), I’m going to have to say it will probably remain that way. They have two locations, one in National City, where I just ate, and one in San Diego, where I first tried them out. I asked them for a little bit of most everything. I got one pork rib, one beef rib, pulled pork, sliced beef and chicken. The sides were beans, potato salad and a corn muffin. Slice of blueberry pie for dessert. No drink. $23. Not bad price wise. My first time there, I did have the ribs, which were tender then and they still are today. Just no smoke I can taste at all. They said they use Oak, but it was only noticeable on the beef rib. But that beef rib was so tough, I was literally not able to get even a bite off of it! Wow, really?? 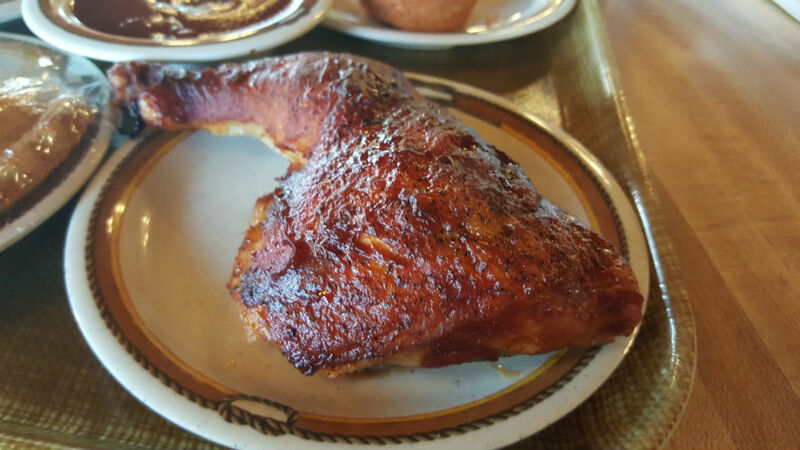 While the pork rib was very tender, it just wasn’t very tasty. I liked their sauce a bit better than I did years ago, but still not a favorite in any way. It’s a bit vinegary and lacks any depth. The sliced beef did not fare well either. It was quite dry and a bit tough too. Meat should stand up alone and adding sauce is like putting a band aid on a boo boo…it’s not going to make it better, it’s just going to cover it up. The pulled pork on the other hand, was slathered in sauce and I didn’t get to taste that meat on it’s own at all. Not horrible, just meh. The protein that was the best in my opinion was the chicken. They do ask if you want dark or white and I chose dark. My whole life I only ate white meat because I thought dark meat was just gross. When I became a judge, I found out you pretty much only get dark meat when you’re sampling an entry, so I’ve learned it’s the most moist and therefore a better cut of meat. Theirs was tender and the tastiest of all the meats. The beans were ok. Again, I seemed to like them better than when I raged against them years ago. There are just so many better beans being cooked out there, so by comparison, they didn’t hold up. The potato salad was a mayonnaise disaster. It was drowning in that stuff and I didn’t even want to take it home. You have a choice of a corn bread muffin or a dinner roll. I chose the muffin. They offered me honey with it, yes please. It would have been better if the roll was heated up. It was just cold and unappealing. Even the slice of blueberry pie was nothing to write home about. Darn, I was hoping that was gonna save the day, guess not. Not one bit of flakiness in their crust. When I brought home leftovers the boyfriend said it tasted just like a pie you would buy in the market and I had to agree. I truly hate dissing a place that so many locals like. And yet look how long it has lasted. 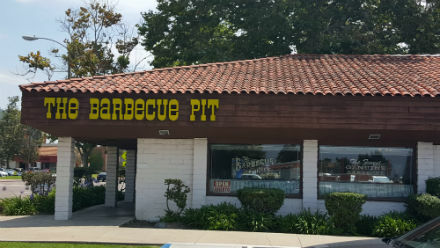 I feel that most of their regulars have not tried too many other BBQ joints, except maybe for Phil’s. And even though Phil does not smoke his meats, they are tender and tasty. As I said years ago in my old review, the people that work there couldn’t be nicer, and they still hire some friendly folk. So, even though I don’t rate them very high in my BBQ book, I am glad they appeal to the crowd they do, but I will be taking my Q cravings elsewhere.